The upper ravine, wedged between Ruter and Bentley Halls, was a popular site for some construction projects in the late nineteenth century. In the 1880s, the road over the ravine between Bentley and Ruter Hall had been widened and raised. The process blocked water flow so that in the fall, winter and spring a pond existed in the upper ravine fed by springs and runoff. 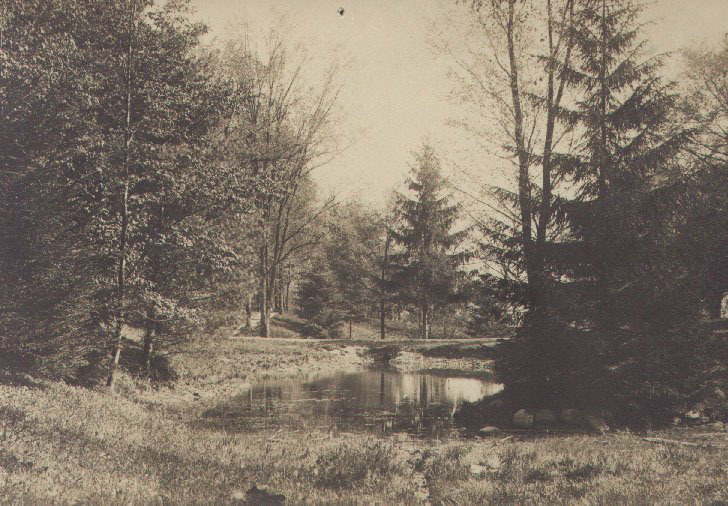 The pond was dubbed “Lake George” by the students (a satiric reference to the famous tourist spot in the Adirondacks), but called a “filthy little pool” by The Campus newspaper. It became a popular hangout site for students. Legend tells of an alligator released into the lake that did not survive the frigid winter months and in the spring, the gator’s putrid body arose to the surface of the pond. The pond was made useful as a reservoir in case of fire. In the late 1890s, Lake George was filled in as part of a campus beautification initiative. Genesis Valencia, “Upper Ravine and Lake George,” NW PA Heritage, accessed April 26, 2019, http://nwpaheritage.org/items/show/49.